Fried Pig + Nutty Monkey = ? What do you get when you cross a fried pig with a nutty monkey? I have no idea, but it tastes surprisingly good! (Yes, I know my titles are a little crazy and somewhat dorky sometimes. 😀 ) Ok, so it’s not quite sushi although it does use sumeshi… but I figured why not? 🙂 This is one of those things that actually taste a lot better than they sound. It has a nice gooey crunchy sort of texture to it, and would make a great breakfast food. Another thing you might like to try is to omit the bacon and sumeshi, and sprinkle powdered sugar on the finished peanut butter-banana wonton things. I made a few of those, and they would make an amazing dessert! Just make sure you serve them almost immediately so they are crispy when you eat them. So… what else would you like to see up here? I’m always open to your ideas, so feel free to leave a comment or contact me with your sushi requests! I got the idea for this from “Sushi American Style” by Tracy Griffith, although I changed it slightly to better suit my purposes. Fry the bacon as crispy as you like it. 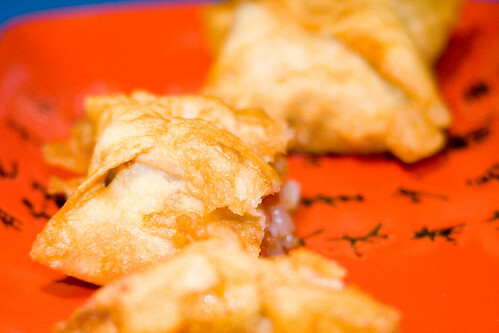 Place a dab of peanut butter in the middle of a wonton skin. Place about 1 teaspoon of sumeshi on top of the peanut butter. Place a slice of banana and a 1 inch piece of bacon on top of the sumeshi. 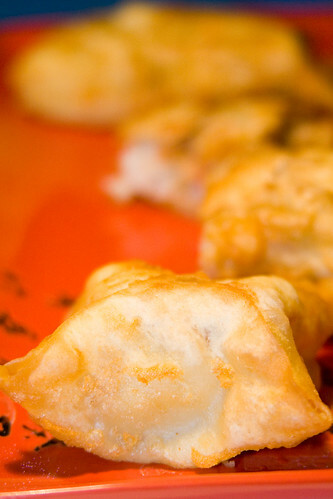 Fold all four sides of the wonton skin in. Place a dab of peanut butter on the last flap to keep it closed. 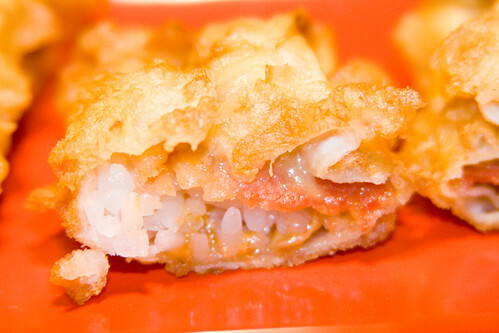 Dip in the tempura batter and tempura fry it. 😀 This was originally called the Elvis roll, but I had no idea why and I had changed the recipe a little, so I went a little crazy with the name. 🙂 Apparently Elvis used to like fried peanut butter banana sandwiches, which kinda relates to this, but I have no idea where the bacon came from. Any Elvis fans out there who could help me out? I think he liked bacon in the sandwiches too? I’m not sure… I’ve seen it on TV a few times (Paula Deen likes Elvis and did a version of his sandwich once) but don’t remember the exact ingredients. This sounds really good- I can imagine the bacon fat/chewy/salty complimenting the banana quite nicely. Yummy. I’m always looking for interesting things to do with wonton skins, too! Thanks! Hey! Great recipe – I tried it out last night. I skipped the bannanas though…me and the gf both despise bannanas! I wonder if it would work with some other fruit – I think apples might be good. YUM! A perfect snack!